Welcome to the Whitemarsh Valley Inn, where fine dining in a colonial setting is aimed to please even the heartiest of appetites. We pride ourselves on our selection of fine Black Angus beef, fresh seafood and milk fed natural veal. Now that we've shared some words to whet the appetite, sit back, relax and let us share a bit of our history with you. In 1853 this three story building was constructed to house the Marble Hall Lodge of the Odd Fellows, a charitable fraternal organization. The name is explained from the fact that that organizations that rendered aid to members in times of need were exceedingly rare. Strong feelings against secret societies were great. Hence, this building looked like numerous other structures along Germantown Pike. The two lower floors constituted two dwellings, and the meeting hall was the entire third floor. The lodge was kept alive until 1925. After prohibiton, the two dwellings were converted to one and became a tavern known as the Marble Hall Inn. It functioned as such until 1971 at which time it was known as The Wooden Nickel Tavern. 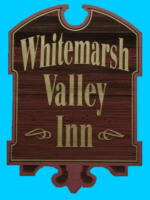 In 1990 the building was renovated, and on November 8, 1991, we opened as the Whitemarsh Valley Inn. The Odd Fellows meeting hall on the third floor is still intact - including the stage where shows took place. A little history still remains. We are proud of our food. We value our reputation. We value our customers. Since all dished are prepared to order to ensure freshness and quality, we ask that you please be patient. Thank you. Old Fashion Charm, Great Food, Sophisticated Crowd, Live Piano Music, Warm Hospitality Characterize this Inn. The Inn is open daily for lunch and dinner.